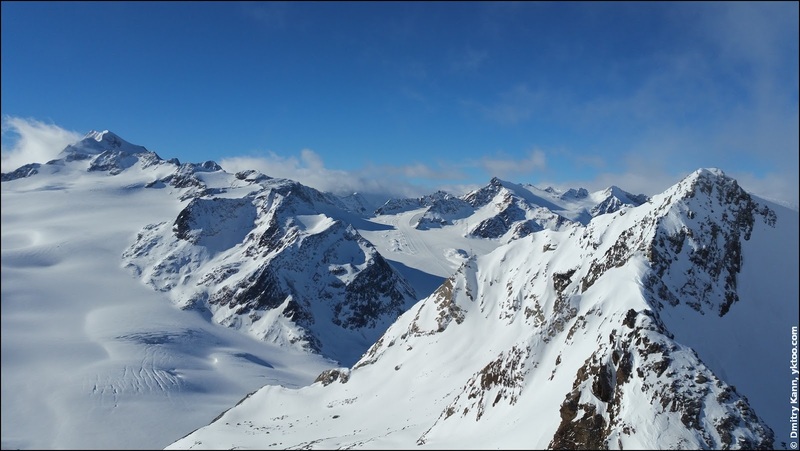 Our destination was chosen to be the Austrian Sölden, also located in Tyrol like Ischgl where I'd been a year ago. We drove all the way to Austria, with most of the route going through Germany. Despite the snowy weather the motorways were dry and clean. What's also remarkable about German autobahns is the absence of speed limits and free roadside toilets. German stretch of the road. 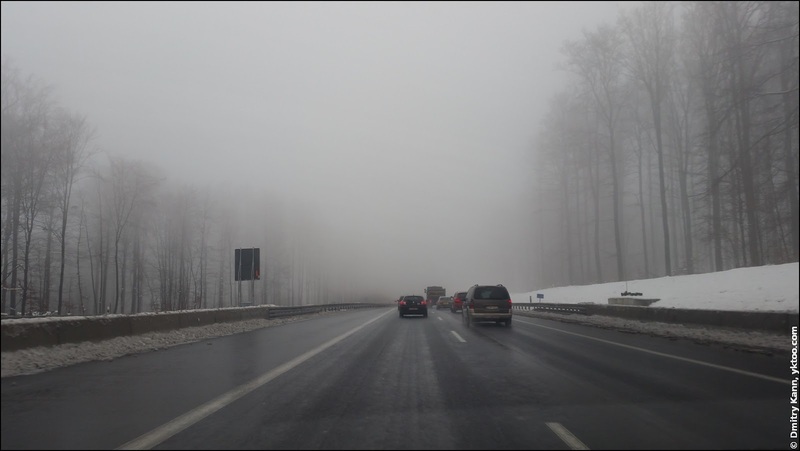 But since it's winter, moist and foggy, I preferred to drive at 150-160 km/h (ca. 100 mph). Every now and then you cross road work zones with the 80 km/h speed limit and two-metre wide lanes, which is quite annoying. On the bright side, despite the reports of Austria enforcing border checks to curb the inflow of refugees, we were stopped at neither Dutch-German nor German-Austrian border crossings. As you perhaps know, you need a special windscreen sticker (vignette, about €10 for ten days) in order to use Austrian motorways. Furthermore, you get charged another 5-11 euros on the most popular routes. And finally, your car has to run on winter tyres (which are hardly used here in Holland). On your way you cross numerous tunnels, with the most dreadful one being the Arlberg Straßentunnel, 14 km (8.7 mi) of two-lane, poorly illuminated road with the 80 km/h limit. In theory you can cover the whole way in nine hours, but because of occasional traffic jams and unavoidable breaks it took us a couple of hours more. That said, it can still be worse as late January is a low season and no school holiday period. 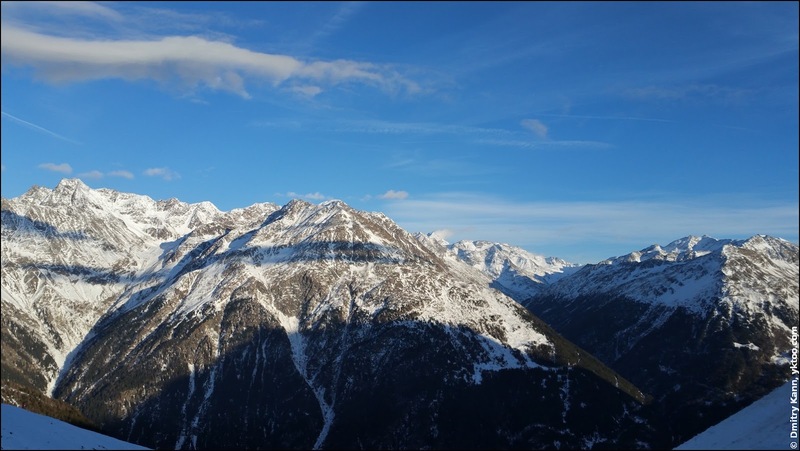 For determined ones there's also a bus option, with departure from Amsterdam or Utrecht via Innsbruck, totalling some eighteen hours of travel and a couple of bus changes. The price of this hardly enjoyable experience is about €50 per person. 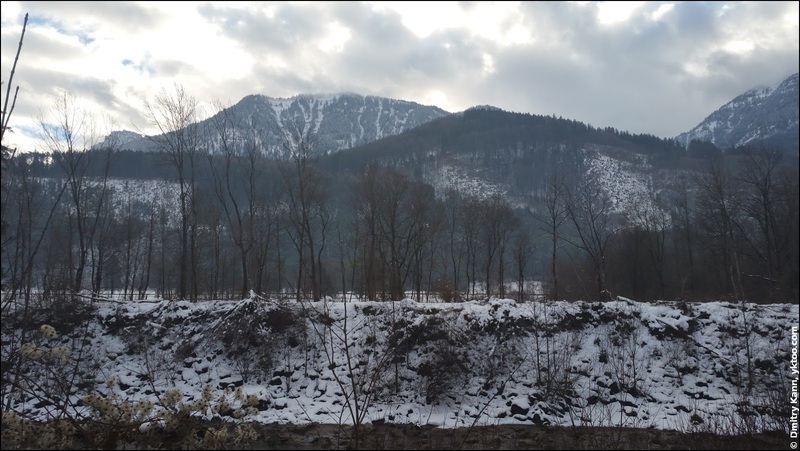 You first get the sight of mountains on the German side, they grow eminent as you near Austria. 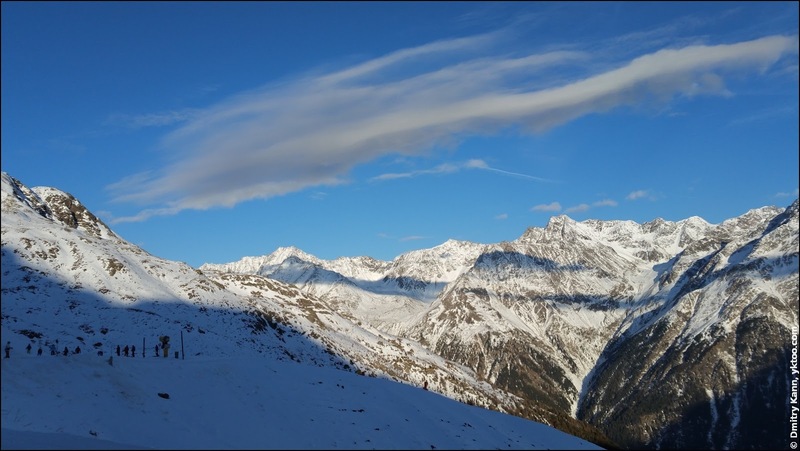 The last thirty or so kilometres you drive along the Ötztal valley, squeezed from both sides by Alpine slopes. 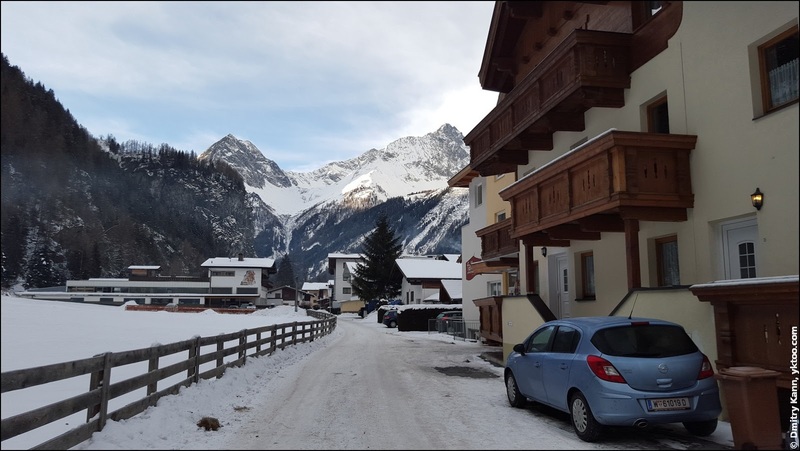 We stayed in a hotel in the town of Längenfeld, some fifteen minutes drive on the winding mountain road from Sölden. The apartment had a view on the mountains, or, rather, mountains was the only thing one could see from the window. Längenfeld and our apartment complex. 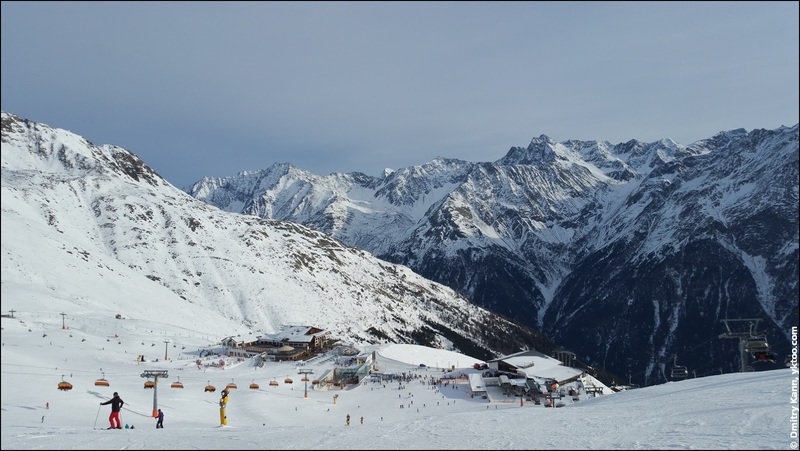 Sölden is another little town down the Ötztal valley, looking very much like Längenfeld but with a vast skiing area. 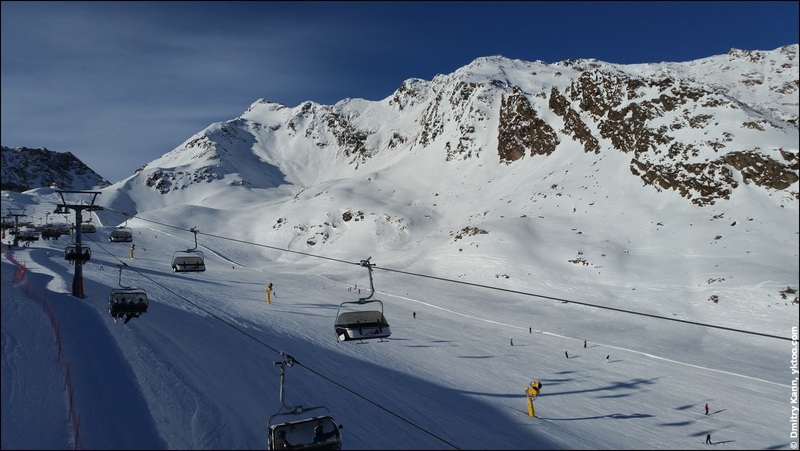 It's smaller than one in Ischgl (33 vs. 45 ski lifts and 145 km of pistes vs. 238 km in Ischgl), but somewhat more intricate. 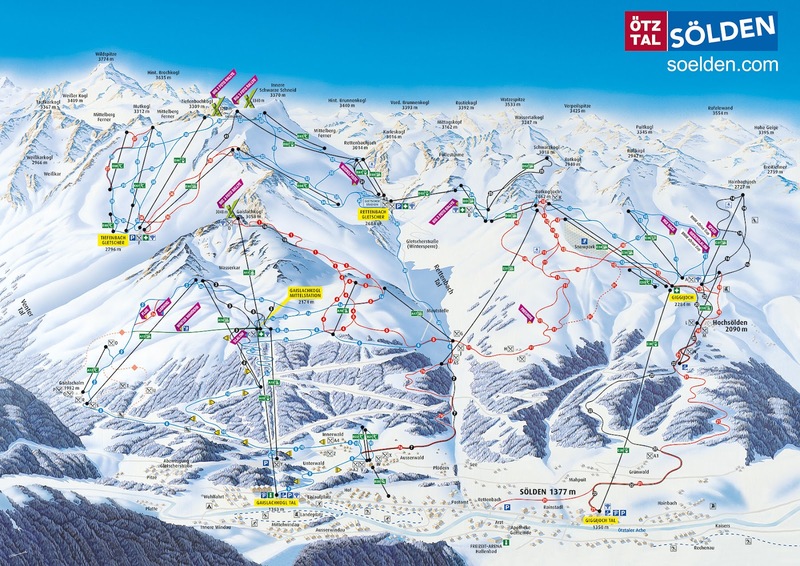 Ski map of Sölden (source: soelden.com). 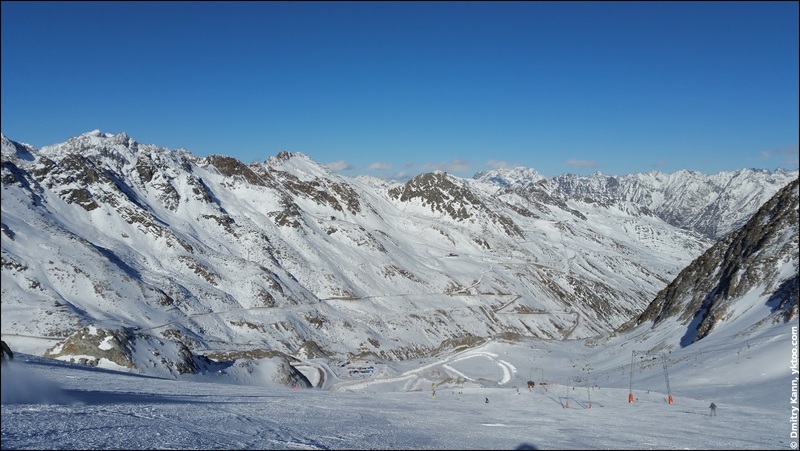 So for example the top left area called Tiefenbach Glacier (Tiefenbach Gletscher) is only accessible via a chain of lifts and slopes starting at top right. 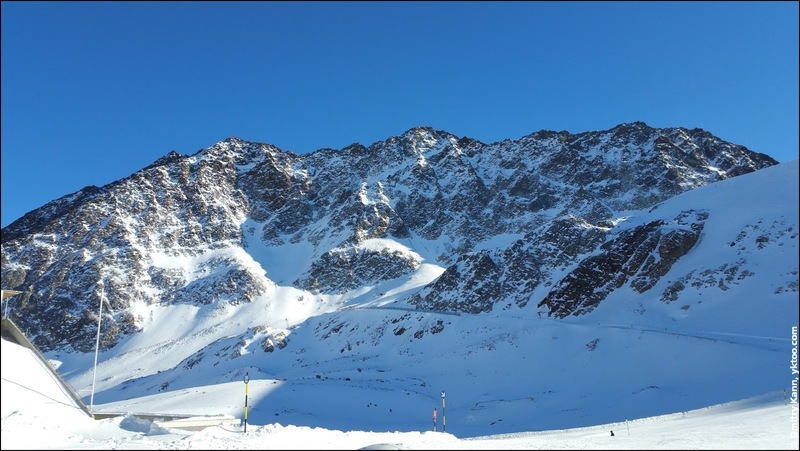 The first lift brings you from the altitude of the valley, 1350 m, to 2284 m in about ten minutes of ominous silence. 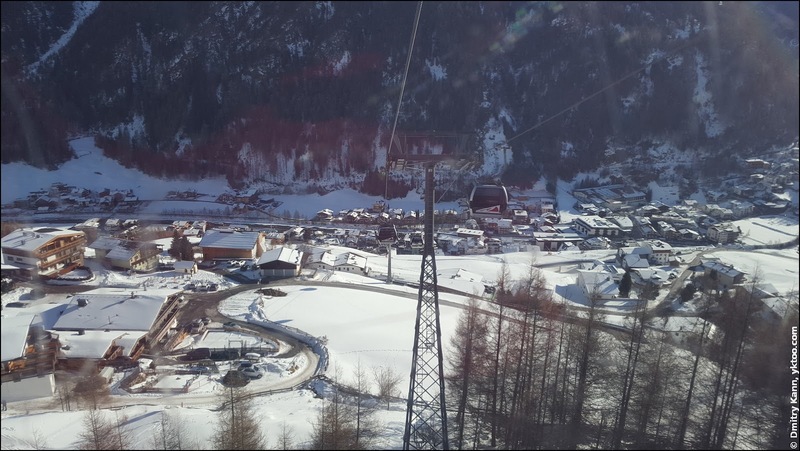 Sölden from the cable car. 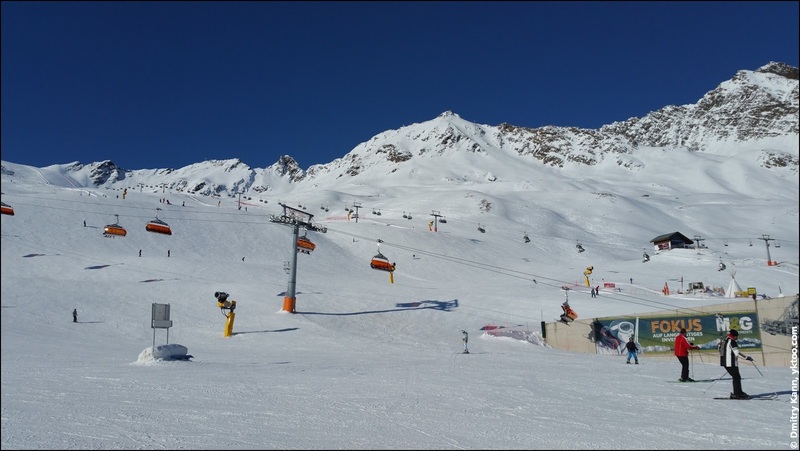 This time I switched from skis to snowboard, just as I planned, for the first time in my life. 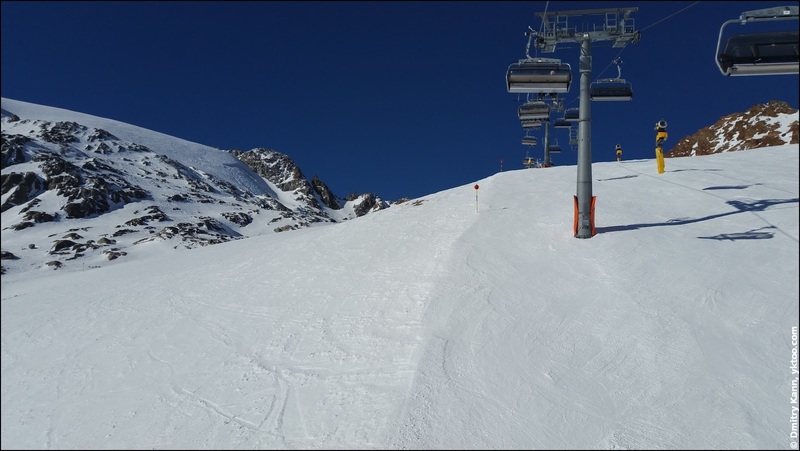 This resulted in a multitude of new sensations in various parts of my body, mostly arising from their contact with the hard piste. 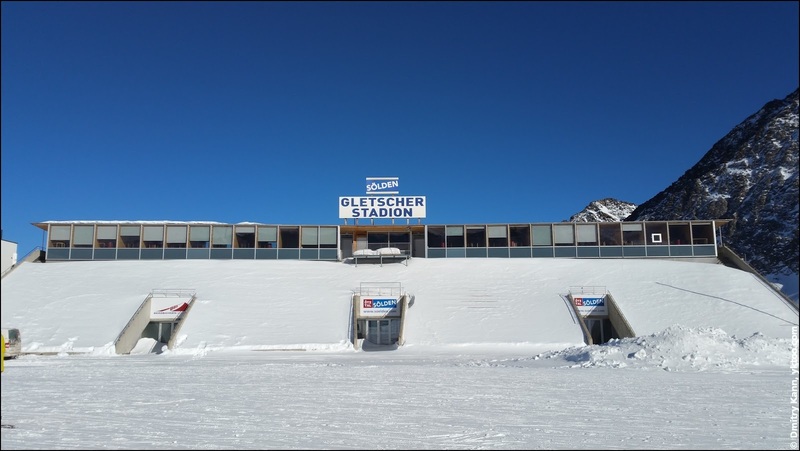 Despite the basic training I previously got indoors, I failed even to stand up on that stupid board on the slope. 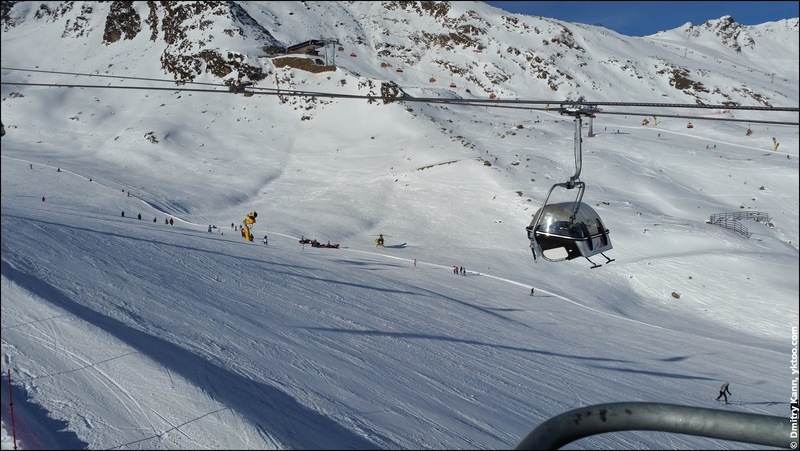 Then I stopped trying and went to find a skischule, which are plenty there. After four hours of tumbling downhill with a small group of Dutch I could finally slide on both toe and heel edges, as well as switch from one to the other. 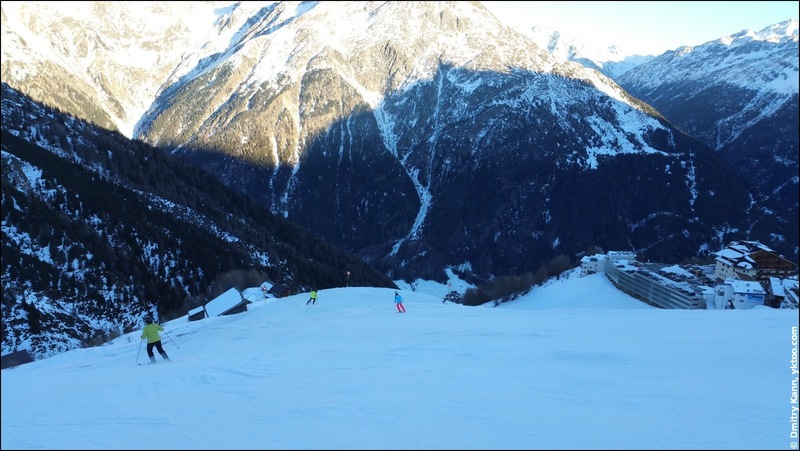 We practised on a short stretch of the piste, climbing it up all the time. Which proved to be pretty tiresome. 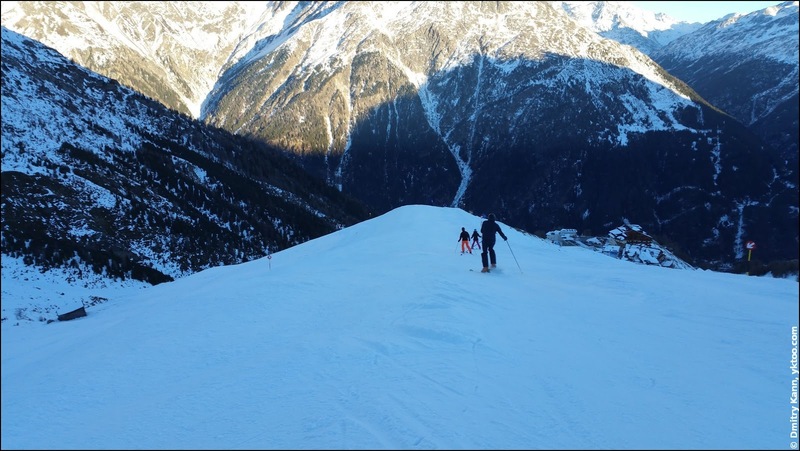 Our share of the piste. I exercised these basic techniques during the next five days, and quite successfully I must say. 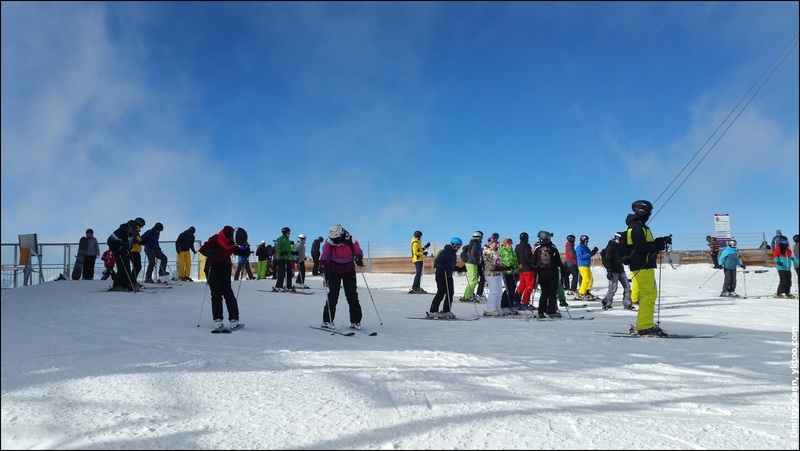 If you're a beginner like me you can save some euros by buying the Beginners Pass (€26 per day) instead of the full one (€51). 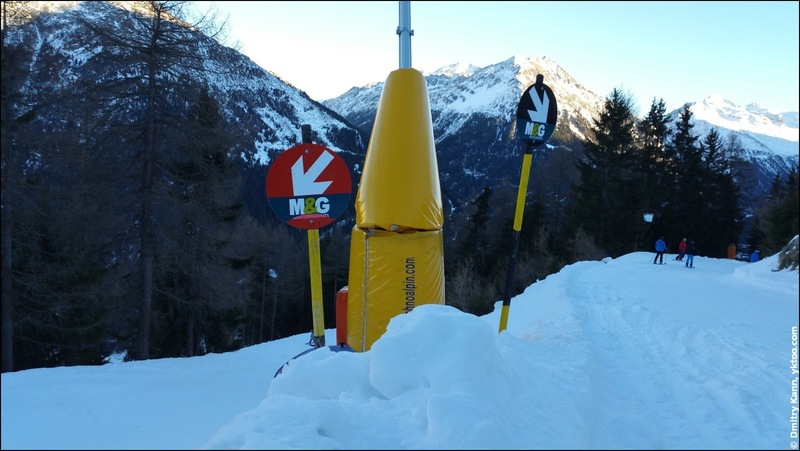 It only gives you access to one short (Mini lift Giggijoch) and one regular piste (number 13). But for practising your falls and rolls it should suffice. Piste no. 13, my best favourite. 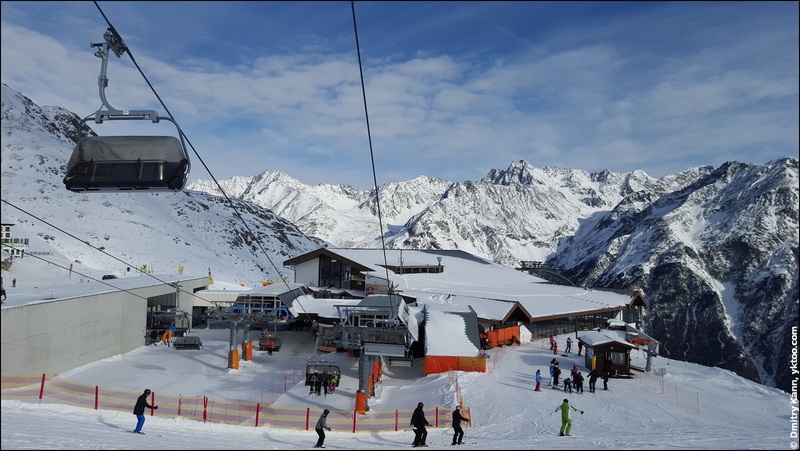 When we would exit the cable car in the morning it could be as cold as -4 °C (25 °F) up there, but on a good day the sun was as bright as in the summer, and the air temperature would climb up to +10 °C (50 °F), but luckily the snow didn't melt. 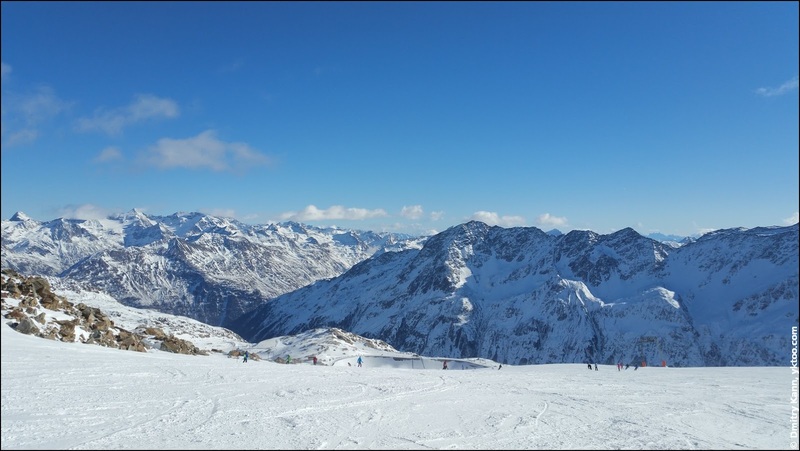 The solar radiation is also stronger there considering the altitude of two kilometres plus, and it gets really, really hot in your ski suit. 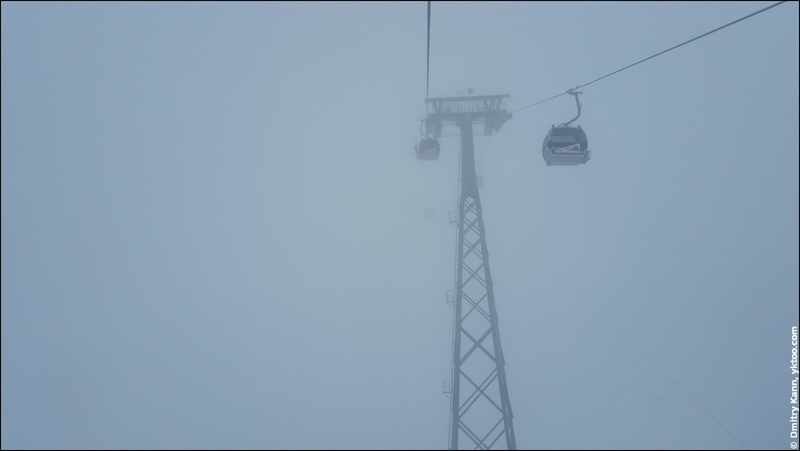 And at precisely 4 PM, when the ski lifts got closed, the sun hid behind the west ridge. The sky was clear most of the time. 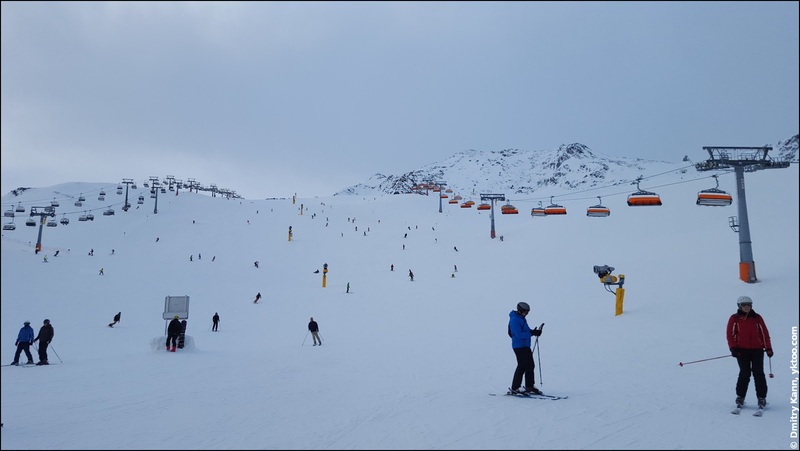 After five days we got bored by "the Thirteenth", so on our last day we bought a full ski pass and ventured to see the rest of the resort. 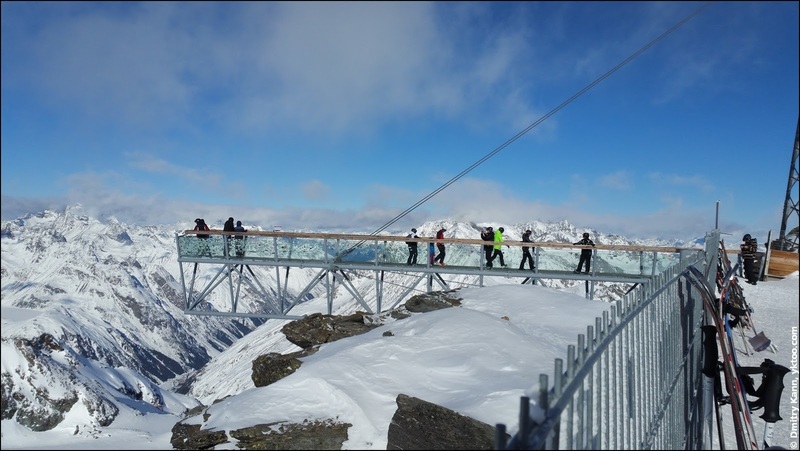 First we took the chain of lifts up to the very top, to the Tiefenbach Glacier. That morning was so foggy that one could hardly see anything in a few metres away. That alone gives you an adrenaline rush. 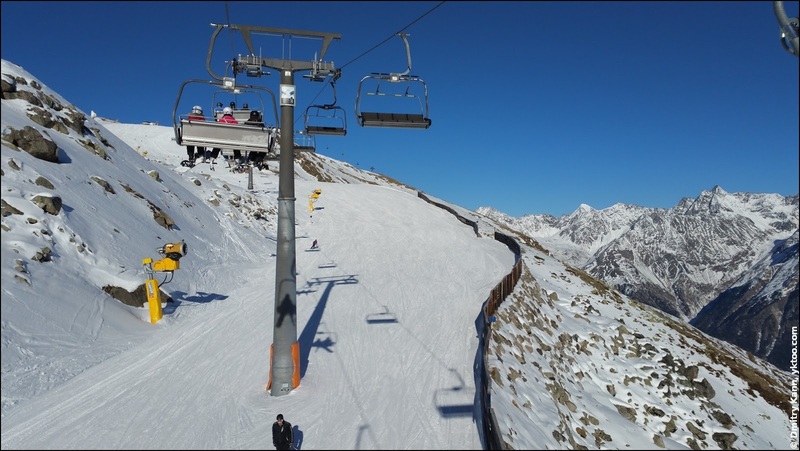 The lift to the Tiefenbach Gletscher. The ski tunnel on the glacier. 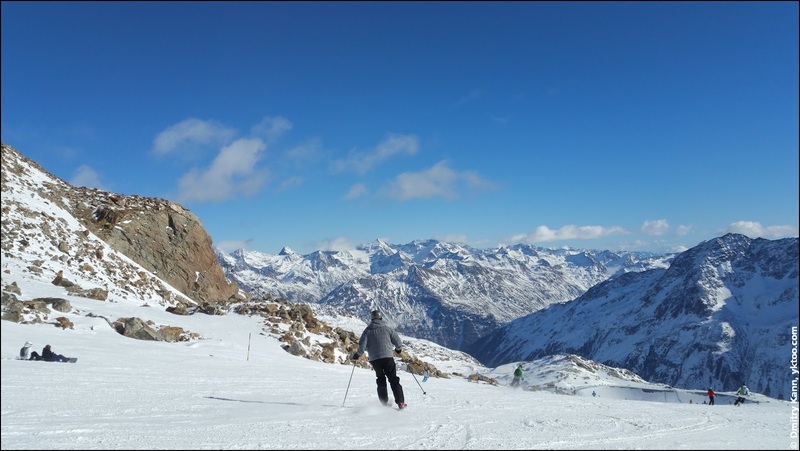 The pistes on the glacier are immensely wide and long. Going down this one takes some twenty minutes — as compared to 5-7 minutes on "the Thirteenth". And the view is admirable! Specially for selfie-junkies there is a hanging footway, jolly frightening for some. 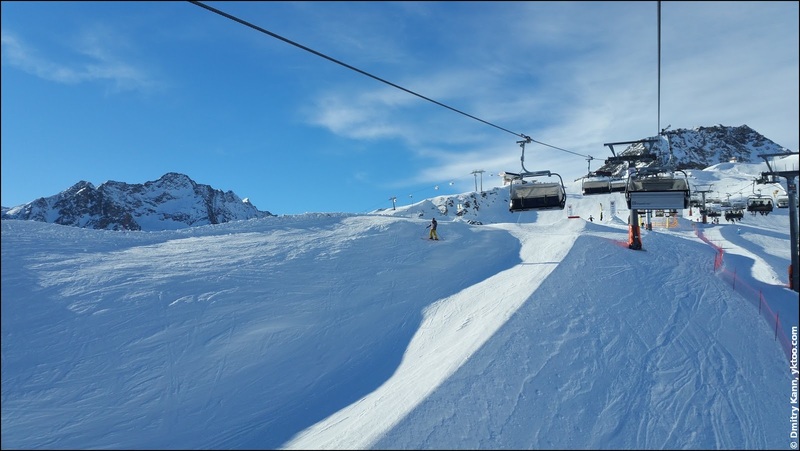 It seems that late January is the best time to go to the Alps thanks to (1) the perfect sunny weather, (2) abundance of snow and (3) not too crowded pistes. Of course the first two are a matter of luck, but a lot more people come in the first half of February. 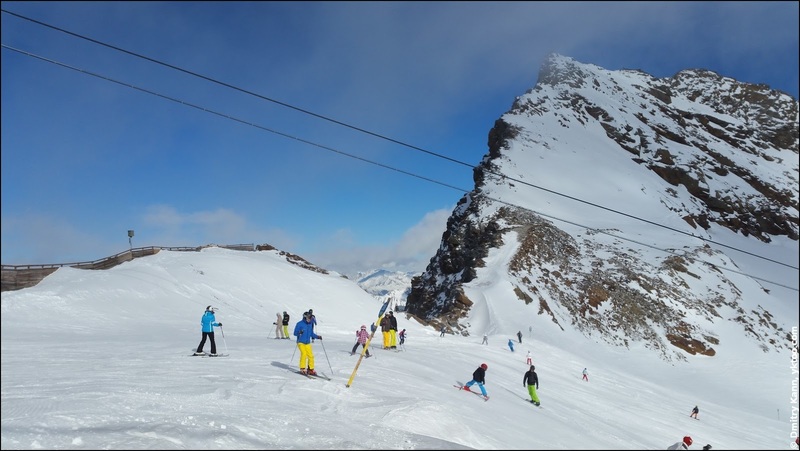 When we were there, the queues at the lifts were fine, we hardly ever had to wait longer than 3-5 minutes. 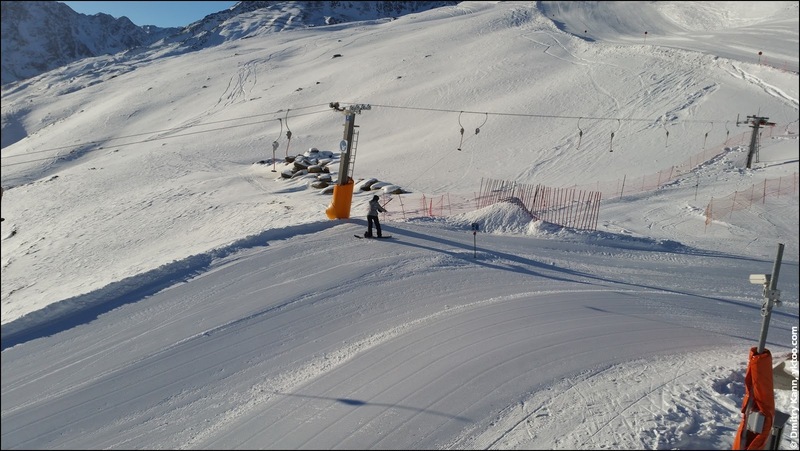 Once I've missed a fork and almost taken a "black" piste, but spotted it on time. 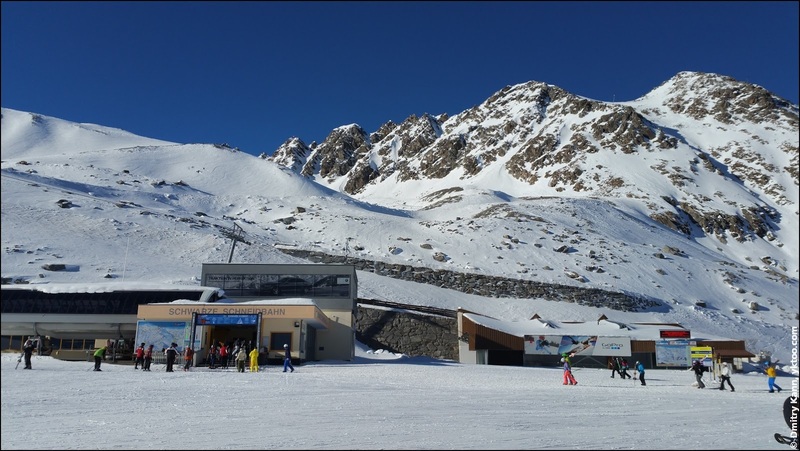 Piste to the town: the fork. The last stretch before the foot of the mountain was the hardest. 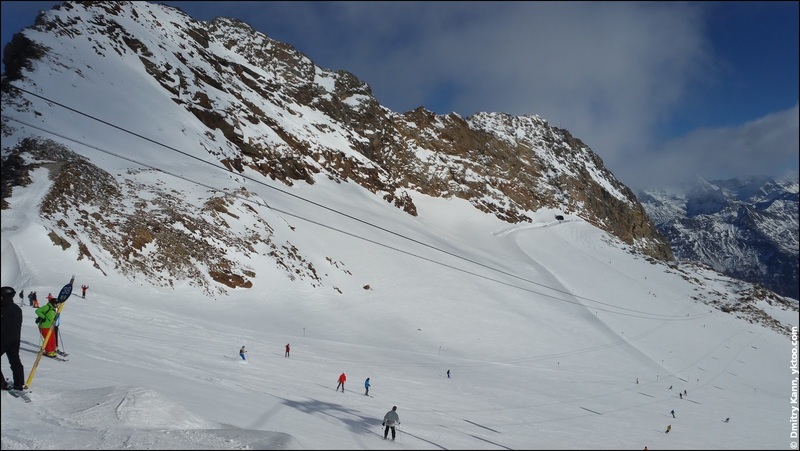 It was so steep that some skiers were almost crawling, and full of loose snow. But I managed. Once you're past the initial learning curve (usually the first couple of days) and able to keep your balance during edge slides and turns, you can progress much faster by just following your natural instincts. I can't say the same about skis. 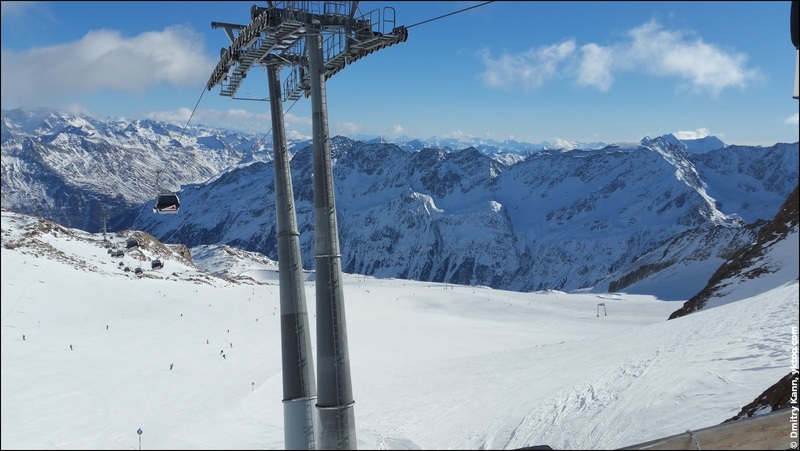 It's much less likely to break a foot or leg while snowboarding simply because your both feet are firmly attached to the board. That said, it's still well possible to get a concussion or break your wrists on a fall, but all it takes is being careful and moderating your speed so that you stay in control. 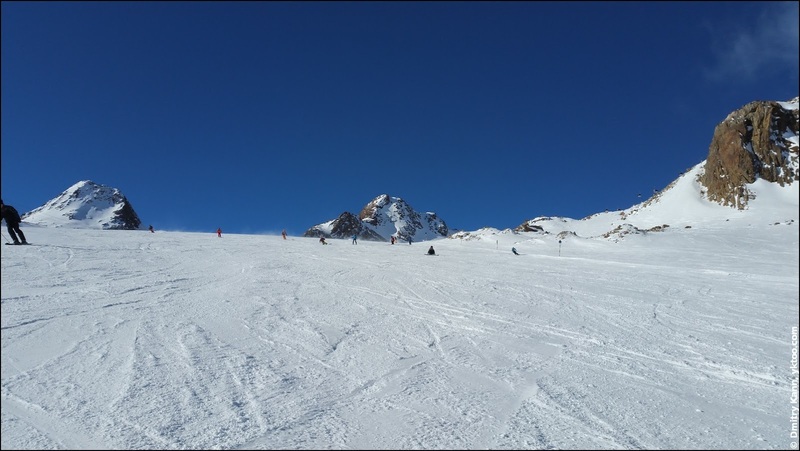 Snowboard gives you confidence on a steep slope. 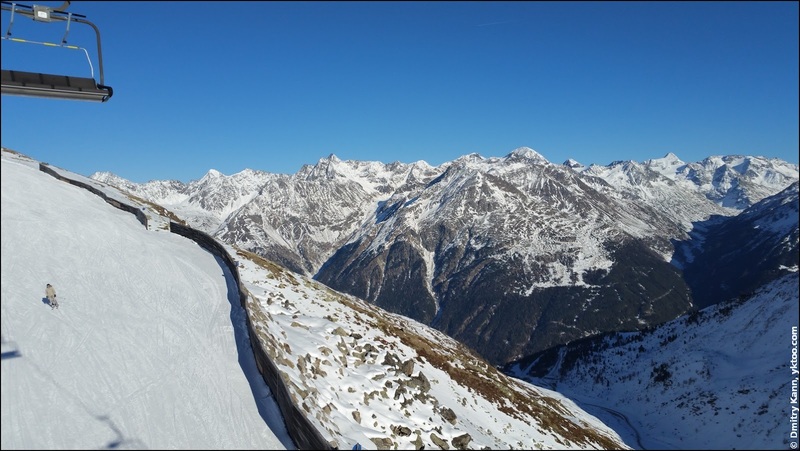 If you're not feeling like making turns or the piste is hostile, sheer and icy, just carefully slide on your heel edge while jeering at the frantically zigzagging skiers. 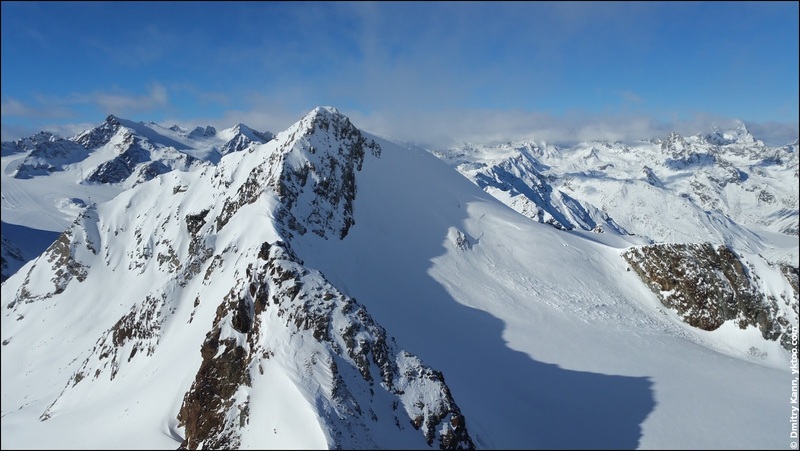 Snowboard is a single piece of gear, whereas skis and poles are four. They tend to run loose while being carried. The last but foremost: the boots! I even managed to drive wearing the snowboard boots when I felt too lazy to change. Ski boots are monstrously heavy and rigid. 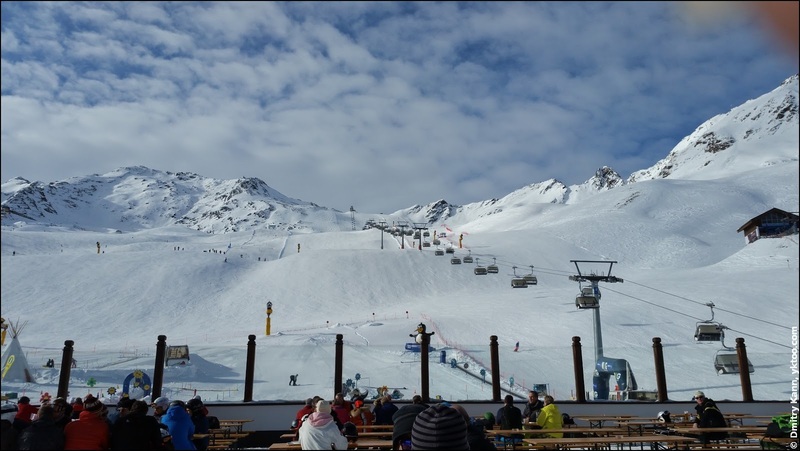 Of course, wintersport is no cheap entertainment, with the most expensive items being the accommodation and ski passes, especially if you come with the family. Driving is tedious but doable, on your way back your body is even delighted with the opportunity to sit still for a few hours in a row. A few more photos below.